Wisconsin is “America’s Dairyland.” This beautiful Traveler’s Guide map shows so many interesting stops! It contains information about cheese tour hours and fun facts about the thriving Wisconsin dairy industry. Whether you collect neat maps or are looking to take an interesting trip to Wisconsin, this map will please you for years. You can only get one map per request, but getting it is super simple! All you need to do is fill out your information, including your name and address. Complete a quick captcha, and submit yourself for delicious, cheese-y map goodness! Phone and e-mail are optional and not required. This offer is only valid in the United States. Don’t miss out on this cheese map. We don’t know how long it’s good for, so grab it while you still can! 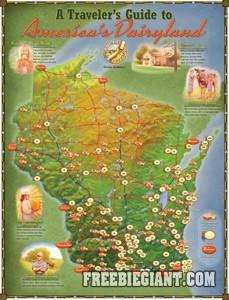 Click here to get your free Wisconsin Cheese map.